We sat down at a work table with the following resources: A3 paper, coloured pens, a copy of our old timetable and two cups of tea. we knew that the first hour would be spent meeting each other and breaking the ice, so we looked at this initial meeting with the trainees as if it were a speaking activity. What would we be doing if this were a lesson and we wanted the class memebrs to talk? Well, we’d give them something interesting to talk about and then let them talk. While they would be talking, we would be taking language notes on the quiet for feedback later. Then we would go on a tour of the building and grab a cup of tea. So where next? We always liked the idea of a foreign language lesson but wanted to put the experience to work differently. With this is mind, we ditched the post-lesson reflection which prescribed discrete aspects of the lesson (“how did the teacher correct your errors? How did the teacher convey meaning of new words to you?” etc.) and replaced it with three short questions which could be written on the whiteboard – one about how they felt, one about what they noticed about the new language and one about what they noticed the teacher doing. By now we thought it was time for lunch, so we pencilled that in. No lunch for us, though! we would spend the time looking at our language notes from earlier and deciding how to present this language on the board for investigation with the group. We decided only to select examples of well-formed language (even if we heard errors or slips) because we thought this would illustrate that faultless language can be a rich area for learners to explore: in other words, there is more to language feedback than error correction. After lunch, we would remind the trainees of the way we started the day and tell them that we were about to present some things they had said back to them and explore it together. After doing this with 4-5 examples, we would ask the trainees to reflect on the experience and note a) specific things we said or did and b) specific things we wrote on the whiteboard to focus their attention on something about the language. After the group had discussed these questions for a while, we would pool the observations on the whiteboard and chat about them. We were slightly concerned about how to respond if the trainees “hadn’t noticed everything” but we were determined only to work with what came rather than then “deliver” ideas which had gone unnoticed. This was because we suspected that if something hadn’t been noticed, maybe they weren’t ready to notice it and it wouldn’t be taken on board, using reasoning similar to ideas relating to SLA. By now, the trainees had experienced with us a speaking activity and feedback session (as well as the beginner-level foreign language lesson), so it was time to help them get ready to teach (first assessed teaching would be on day two). We had already decided that setting up and managing speaking activities and giving feedback on what got said was high on our list of what makes a good teacher, so it seemed natural for TP1 to be a speaking-focused lesson. As there were so many simple frameworks for lessons in Teaching Unplugged, we selected 4-6 of them and allotted one to a pair of trainees, each of whom would later be teaching in a different TP group at a different level. In this way, we wanted to establish that the deciding factor in a lesson “working” was not whether the “material” was “level-appropriate” in general, but to what degree the teacher made use of it with their learners in mind. We asked the trainees to go through an exploratory cycle of familiarising, querying and rehearsing; this would, we thought, be a simple and practical routine for them which would demystify the “lesson planning” process, especially when it involved someone else’s ideas (like a course-book). In order to lead by example, later that day we tutors met and taught the TP students who the trainees would later be teaching. For this lesson, we both chose to use the lesson idea “How I Got My Name” from Teaching Unplugged. We both took different approaches to it, and so the lessons were different in many respects, but shared a common framework. During this first encounter with their new students, we asked the trainees to do two things: 1) note down the steps they saw us taking during the lesson for discussion the next day; 2) listen to the learners and note examples of good, bad or curious language use for exploration the next day. The outcomes of these two observation tasks would become the raw material for the input sessions on day two. Interestingly, the input would not be coming from us, the tutors, but from the notepads and observations of our trainees. It was at this point that we started questioning the appropriateness of the term input for what was now going on! We were on the way. This is a fascinating record of your actions and thought processes – I’m really looking forward to what follows. Thanks Sputnik – it’s good to know that! Great stuff, Anthony! I’m fascinated – a little envious even – that you’re exploring unplugged principles in the context of a pre-service course. Have you thought of asking trainees to keep a training log of personal reflections? Or would that be over-egging the omelette? It would be very interesting to track their responses to this kind of training, as well as making useful data for some retrospective research. Another thing: the foreign language lesson – did one of you do this, or was this a guest spot? Was the lesson of a more traditional (e.g. PPP) format? Did this matter? (Perhaps not, if the lesson was intended to “put the trainers in the learners’s shoes” rather than model teaching procedures). I’m sure you can keep your envy in bounds 😉 The idea of a personal log rather than lesson by lesson evaluations is an idea that has come to me more than once, but I have shied away from it. I think it could be a very useful thing and if we approached it “right”, I’m, sure it wouldn’t over egg the omelette. 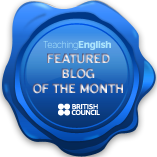 I’m MCT on the next course after IATEFL, so I think your question had prompted me to try it out then – I’ll let you know. I hear you used to run some pretty radical experiments with your trainees back in the day as well: would you be prepared to sketch out the kind of TP related things you did on CELTA and DELTA courses? I’d love to hear it directly from you. Increasingly, we teach the foreign language lesson ourselves, though depending on the language learning background of our trainees, we enlist colleagues who can teach Kiswahili or Mandarin. I’ve mostly been having fun by teaching Old English (Anglo Saxon). This has a wonderful “Aha!” effect regarding language evolution, change and “correctness” apart from anything else. The approach was basically PPP, in that we were dealing with complete beginners (not saying that Dogme can’t be done with beginners, but I didn’t try it) so both things happen: being in the position of the learner, but the questions also help trainees recal and articulate teaching techniques which they at that point were in a position to notice. It is quite hard for us to hold ourselves back and say “Yeah! and did you also notice how we…?” but we are quite clear that whatever they notice at this stage is enough. If we have to provide later, there’s time enough to do it. I was at a fencing competition this weekend and so haven’t finished the next post, which will be a bit of a clarification of what we mean by dogme principles in our context etc. Thank you for stopping by and hopefully see you again whenever you have time!